"A few leftovers and bits from the fridge turn into a great dinner in less than 45 minutes! If I have a leftover grilled pork chop or the tail of a roast, I freeze it until I have enough for this dish. You can also use chicken and substitute some of the veggies for bits you are cleaning up from the fridge. Serve with sweet Thai chili sauce on the side." Heat 2 teaspoons vegetable oil in a skillet over medium heat; cook and stir mushrooms until the juice has evaporated, and the mushrooms are browned, about 15 minutes. Set mushrooms aside. 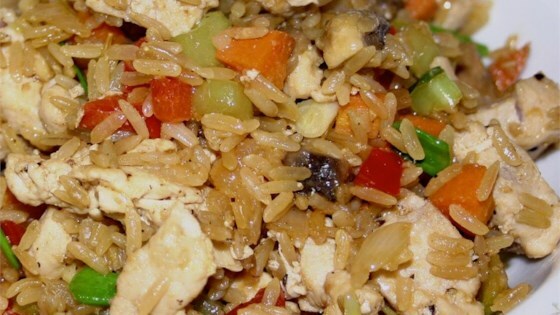 Fluff cooked rice with a fork and stir in 1 tablespoon vegetable oil to separate the grains. Heat remaining 3 tablespoons vegetable oil in a large skillet or wok over medium heat. Cook and stir pork, garlic, and ginger until fragrant, about 1 minute; add celery, onion, and carrot. Cook and stir until vegetables begin to soften, 3 to 4 minutes. Stir in red bell pepper and cooked mushrooms just until combined. Stir in cooked rice, lightly tossing until rice is heated through and thoroughly combined with pork and vegetables. Stir in soy sauce, remove from heat, and sprinkle green onions over the top. This is very good as written and is even great the next day....good luck having some leftover to try! I just made this for dinner tonight and it was very good. I doubled the amount of soy sauce. I also scrambled two eggs and mixed those in. I will definitely make this again! I used it as a base recipe - I left out the celery. Added some hoisin sauce and a dash of fish sauce. Tasty!